This is a pleasant wooded walk out to a 36-foot waterfall on an excellent trail. It’s an easy hike if you return the same way; more strenuous if you continue on past the waterfall on a longer loop. Wheelchairs and bikes can do the first 1 ¾ miles on the paved road. Horse and bike trails connect up with trails into the Jackson State Forest for unlimited riding. Beach access, swimming, tidepooling, diving, rock fishing, sea cave. 707-937-5804. 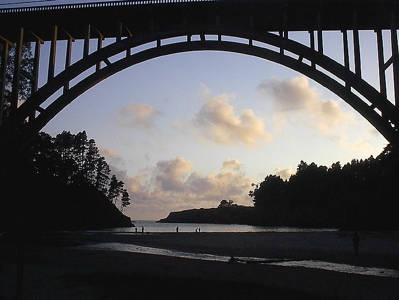 Access: the park is 1½ miles north of Mendocino on Highway One. Turn west off Highway One onto Pt Cabrillo Drive, and immediately left to enter the park. Time & Distance: 2-4 hours for the waterfall hike; 5 ½ miles roundtrip to the waterfall, mostly on an abandoned logging road next to a creek.